Sara Vartanian, founder of Green Moms Collective, recently hosted a Twitter chat about the benefits of shopping at local farmer’s markets. While her #GreenMom chats are always interesting and informative, we thought we’d take the opportunity to expand on the fun and relevant topic of buying local, especially as farmer’s market season kicks off. Shopping at a local market is a great way to be more involved and informed as you set an example for your family’s food choices. As the #GreenMom discussion demonstrated, simply visiting or discussing local food market vendors encourages us to think more critically about our food sources. Does the vendor use chemical pesticides? How many different crops does the vendor grow? Are the farm animals given antibiotics or hormones? What are they fed? Shopping at a local farmer’s market can also help you get out of a food rut because so many different fresh choices are laid out before you. Aviva Allen, Registered Nutritionist, recommends leaving your list and recipes at home, and seeing where inspiration leads you! You might end up basing a meal or a dish around whatever item looked the freshest or was offered at a great price. The experience of shopping at a farmer’s market with your family also helps to instill positive habits in children. Let them smell, touch and sample the food you buy, and learn about how it is farmed or raised. This establishes the practice of thinking about our food sources and quality, and being an active participant in food shopping. 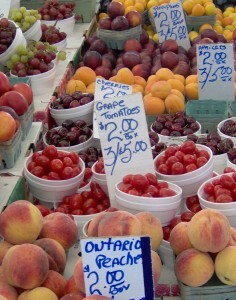 Let’s not forget to advocate for the richly enjoyable experience of visiting your favourite market on a regular basis! Shopping locally, chatting with vendors and getting out in the open air of the market can be a really rewarding way to connect with your children and community. The sunshine, exercise, music and snacks all help to make food shopping an overwhelmingly positive experience, rather than an errand or a chore. Without the resource-demands of the supermarket (scanners, electric lights, and checkouts), the market also provides a greener way to shop. Bring your re-usable bags and your good old-fashioned cash for a simpler exchange and a fun family experience. Do you shop at a farmer’s market? What’s your favourite thing about buying local?